Norwich City’s survival was in the balance ahead of yesterday’s match against West Bromich Albion. Chris Hughton’s men went into the game only 3 points ahead of relegation battlers Wigan Athletic, and were playing high flying West Brom, who have had a great season under Steve Clarke. Only one result today was going to be enough to keep the yellows in the Premiership, especially with their final fixture of the campaign being away to Manchester City. Great build up and quality finishing was definitely the theme for today! Hoolahan came close with his swerving long-range effort, but Foster made a good save to tip it over the bar. Despite Steve Clarke making to changes at half-time, Norwich were still the side on top and got their second goal through bizarre circumstances. Hoolahan’s through ball for Holt was a bit long, but as Foster came out to hoof it clear, he missed completely, leaving an open goal for Holt to score. This reminded me of when Bryan Gunn did exactly the same, many years ago. Norwich scored again only 3 minutes later from a typical Snodgrass free-kick into the box. The in-swinging cross curled dangerously towards Ryan Bennett’s head, but it was West Brom’s McAuley who made the header, giving Foster no chance as it nestled in the right corner of the net. Norwich stepped off the gas at this point and seemed as though they were happy to see out the win, but they weren’t finished scoring yet. Becchio replaced Holt with 5 minutes remaining and made an impact as he set up Jonny Howson. A long ball foward was flicked down by Becchio to Howson, he then played a one-two with Becchio before whipping the ball round Foster from the edge of the penalty box. 3 points were sealed for Norwich and safety is now guaranteed, meaning the Canaries will be playing Premiership football next season. It also guarantees new signing Ricky Van Wolfswinkel will join over the Summer! 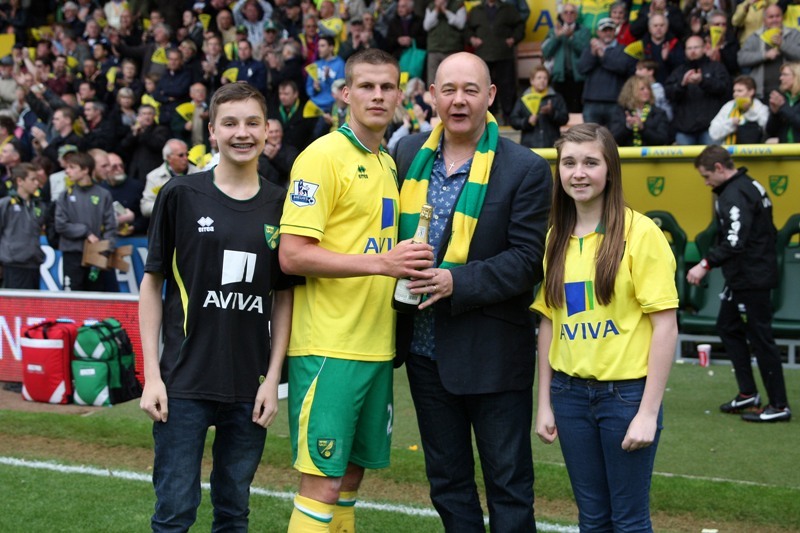 The final Anglian Home Improvements Man of the Match was Ryan Bennett, who again put in a sterling defensive display of football.